Get our top pick in its 2TB form for the best SSD for PC gaming at Amazon right now for less than half price. 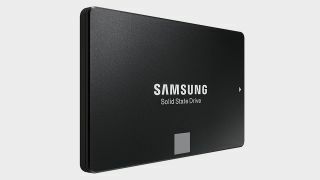 The 2TB of the Samsung Evo 850—our top pick of SSDs for gaming—is at an absolute bargain price at Amazon UK where you can pick it up for only £273.31. This represents a saving of around 56%, which is a decent wedge. While the original price is high (you wouldn't actually pay full price for this SSD), this is still the lowest we've seen. The EVO one of the fastest SATA drives around, has Samsung's reliability, and offers exceptional £ per GB value. The Samsung trades blows with a Crucial model for our top pick of gaming PC SSDs (when looking at SATA models of course) but the Evo 860 regularly wins us over due to its proven reliability, performance and speed. Sure, the Samsung PRO series are quicker drives, but they're prohibitively expensive, and the performance difference is negligible when you consider the hike in price. At this low cost the Evo 860 is an easy recommendation to make, so if you're looking to expand your fast storage for the slew of great PC games coming in 2019, it's time to strike. If you're looking to really stretch budget, we also found the WD Blue SSD series on offer, but they offer slightly slower speeds.